Horizontal distance between points (1). Vertical distance between points (2). Distance between points or the length of lines and polyline segments (3). Radius of arcs, circles and arc polyline segments (4). Diameter of arcs, circles and arc polyline segments (5). Angle between entities or between points and entities (6). Dimensional constraints are created using the current dimension style. To edit dimensional constraints in the Properties bar. The properties of the entity display in the Properties bar. Type a new value or expression in the Expression field, then press Enter. The readout of the Value field changes accordingly. 3. (option) Edit the Name field. 4. (option) Edit the Description field. 5. (option) Edit the Text rotation field. 6. Press the Esc key to unselect. Select multiple dimensional constraints simultaneously to set their value equally. If not already open, open the Mechanical Browser. The properties the selected parameter display in bottom part of the Mechanical Browser. 3. (option) Select the Name field, then type a new name. 4. (option) Select the Expression field, then type a new value or expression. 5. (option) Select the Description field, then type a new description. 6. (option) Set the Exposed field, which specifies whether the parameter is exposed when the drawing is inserted in another drawing using BmInsert. Auto : the parameter is exposed only if it does not depend on other parameters. ON = the parameter is always exposed. OFF = the parameter is never exposed. 7. (option) Set the Units property: Undefined, 1-dimensional (linear), 2-dimensional (planar) or 3-dimensiona (volume)l.
Select the field, then click the down-arrow button and choose an option. Double click the dimensional constraint. The Edit Text dialog box displays. 2. Type a new value in the Text field, then press Enter or click the OK button. The new value is applied and the geometry is rebuild accordingly. Type ddedit or ed in the command bar, then press Enter. Click the a dimensional constraint. 3. Type a new value in the Text field, then press Enter or click the OK button. 4. (option) Repeat steps 2 and 3 to edit more dimensional constraints. 5. Press Enter or right click to stop editing dimensional constraints. All edited dimensional constraints are updated simultaneously. The geometry is rebuild accordingly. Tools to control the display of dimensional constraints sit on the Dimensional Constraint toolbar. Dimensional constraints are hidden when a drawing is closed and reopened. 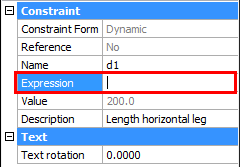 Click the Show/Hide Dimensional Constraint tool button ( ) on the 2D Constraints or Dimensional Constraint toolbar. 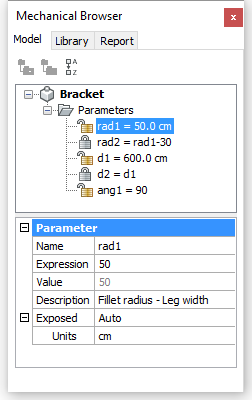 Choose Show/Hide Dimensional Constraint in the Parametric menu. Type dcdisplay in the command bar. BricsCAD reports the number of selected entities. Press Enter to display the dimensional constraints of the selected entities. Choose Hide or Show in the context menu. Type H or S in the command bar, then press Enter. Click the Show All tool button ( ) on the Dimensional Constraint toolbar to display the dimensional constraints of all entities. Click the Hide All tool button ( ) on the Dimensional Constraint toolbar to hide the dimensional constraints of all entities. ON: Display dimensional constraints when entities are selected. OFF: Dimensional constraints remain hidden when entities are selected. Each dimensional constraint is named automatically upon its creation. diameter: dia1, dia2, dia3, ..
angular: ang1, ang2, ang3, .. The name of a constraint can be used as a parameter in a mathematical expression to define another dimensional constraint. The dimensions of the bracket below are controlled through the rad1 radius, d1 distance and ang1 angular dimensional constraints. 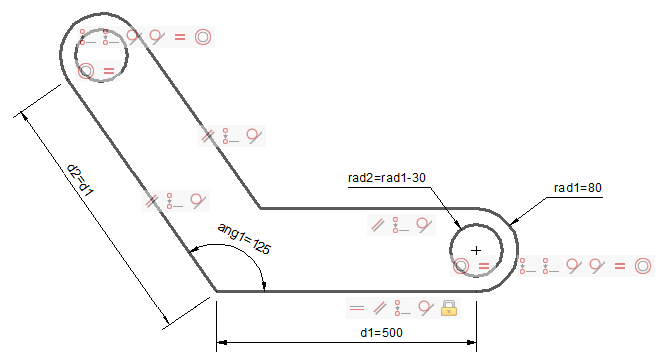 The radius of the hole (rad2 ) and the length of the second leg (d2 ) are defined by expressions. Geometrical constraints force the width of the second leg and the hole in it to be equal to the first leg. 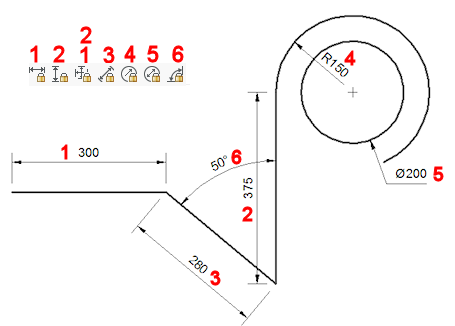 Select either the part name or Parameters in the Mechanical Browser, then right click. Select Add new parameter in the context menu. A new parameter is created. Edit the properties of the new parameter. The constants Pi and e can be used in expressions. The CLEANUNUSEDVARIABLES command purges parameters that are not used in constraint expressions or linked to dimensions. The expression "5 % 2" would evaluate to 1, because 5 divided by 2 leaves a quotient of 2 and a remainder of 1 . Expressions within brackets; innermost sets first. Operators of equal precedence from left to right. (1) Use the list separator character as defined on your system: , (comma) or ; (semicolon).